Mumbai: India’s ‘Know Your Customer’ process will undergo a massive change with the launch of Central Know Your Customers (CKYC) Record Registry. Investors and other individuals will benefit from CKYC record registry. It ensures a uniform KYC process and inter-usability of the KYC records across the entire financial sector. CKYC will also result in a huge cost savings for all the financial institutions and customers. Central Registry of Securitisation Asset Reconstruction and Security Interest of India (CERSAI), a Government of India undertaking, was entrusted with the task of maintaining CKYC Registry, while DotEx International Limited (a group company of NSE) is the managed-service provider for CKYC handling operations as well as the helpdesk on behalf of CERSAI. In CKYC, investors need to submit their KYC details/documents only once with any financial institution. Thereafter, they are assigned a unique central KYC number which can be used across all financial products including bank accounts, MF investments, Insurance policies, New Pension System investments, Demat Accounts, Broking Accounts etc. With the centralized repository now functional, the financial institutions can verify and access KYC records of their customers whose KYC data has been uploaded. There will be no need for other financial institutions to repeat the KYC process. In addition, CKYC will also solve the problem of financial institutions and intermediaries which at present have to deal with multiple KRAs under SEBI. "CKYC will also facilitate faster turnaround at substantial cost savings with an average cost of around Rs.1 per upload, download or update", said Mr. Mukesh Agarwal, CEO, DotEx International Limited. At present, MFs and securities market intermediaries pay about Rs. 20-35 per KYC. The CKYC registry has a robust de-duplication process to ensure that no duplicate CKYC ID is issued. If a KYC record already exists or if someone applies with the different ID proof / contact details then the Registry will be able to flag it to the concerned financial institution using other demographic details. Details like mothers’ name, maiden name are being obtained to strengthen this de-duplication process. As per extant laws, PAN and Aadhaar can continue to be the ID proof. To begin with, CKYC Registry will use Aadhaar and PAN to authenticate the ID proof submitted. CKYC platform is also expected to be of great help to customers who move to different cities temporarily and face problems with submitting the proof of address for changing the address in their records which can be at times cumbersome. In the CKYC Registry, if you are moving to another city, you can update your correspondence address without any proof and once this record is changed at one bank an update notification will be sent to all financial institutions with which the customer has an account based relationship. The registry has gone live on 15 July 2016. CERSAI is a company licensed under section 25 of the Companies Act, 1956. It is a Government Company with the Central Government and select Public Sector Banks and the National Housing Bank being the shareholders of the Company. The object of the company is to maintain and operate a Registration System for the purpose of registration of transactions of securitisation, asset reconstruction of financial assets and creation of security interest over property, as contemplated under Chapter IV of the Securitisation and Reconstruction of Financial Assets and Enforcement of Security Interest Act, 2002 (SARFAESI Act). Besides being a platform of choice for all exchange traded financial products in India, NSE's flagship index, Nifty50 is used extensively by investors in India and around the world as a barometer of the Indian capital markets. DotEx International Ltd. (DotEx), a group company of National Stock Exchange of India, was setup in the year 2000 to manage the securities market data services. 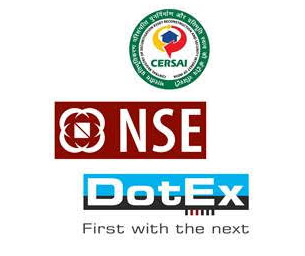 DotEx disseminates NSE’s market data across all asset classes. DotEx is also a SEBI approved KYC Registration Agency (KRA) and provides for centralized storage / digitization of the KYC records in the securities market. DotEx also provides an innovative hosted trading platform called NEAT on Web (NOW) which is a shared CTCL and risk management tool for the trading members.